At Carta we split the organization into four business units operating their own P/L. 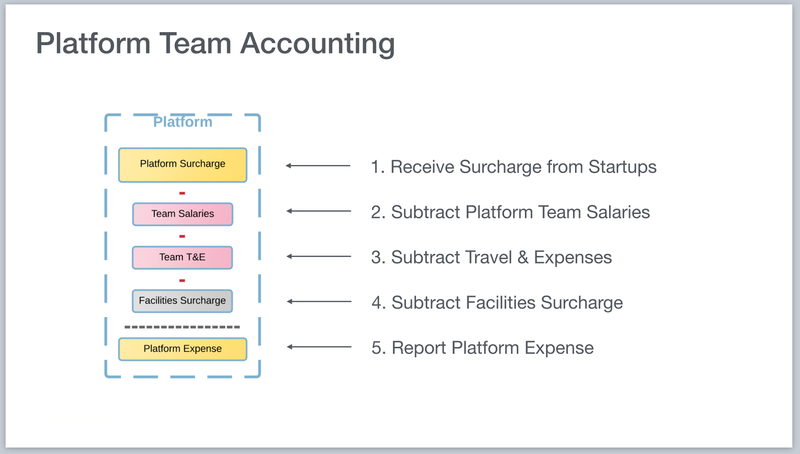 This post is about why we created our business units, how we manage them, the corresponding org chart, and the hiring impact. Every company is different so this is not meant to be a recipe for others. This is just what works for us. I had two goals in writing this post. First, I hope explaining our strategy is helpful to other ceos thinking about structuring their organizations. And second, self-servingly, I hope there will be a few founders or executives who like our strategy and come join us. 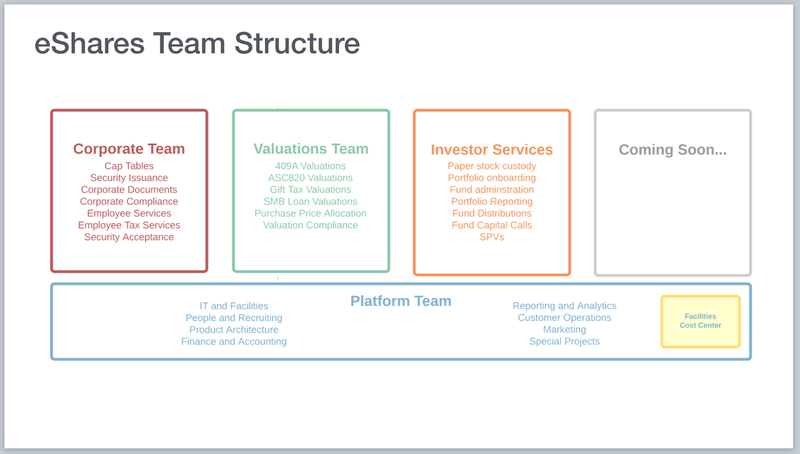 Today we have four business units: Corporate Team, Valuations Team, Investor Services Team, and Platform Team. Corporate Team is our largest business unit and sells services to companies including equity management and corporate governance. 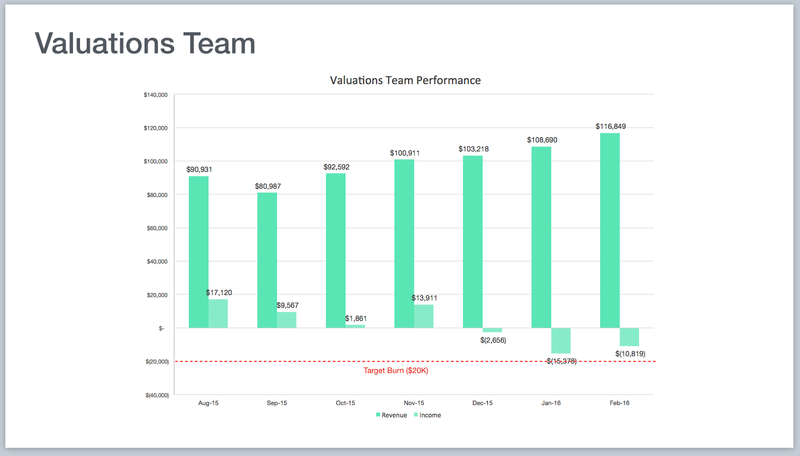 Valuations Team sells 409A Valuations to companies and ASC820 Valuations to venture funds. Investor Services team is our youngest business and sells portfolio management products to venture funds and angel investors. Platform Team provides cross-BU support services to help grow the business units. These range from office management and people to technical architecture and brand marketing. We will launch our fifth business unit (marked “Coming Soon…”) in Q1 2017. 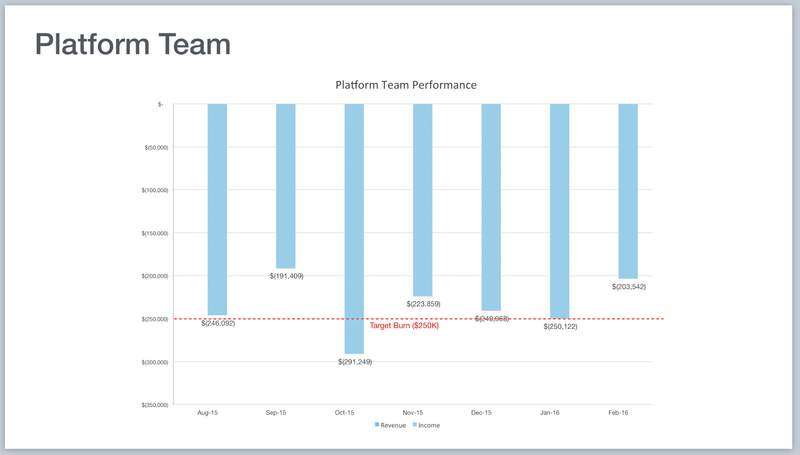 Each business unit, aside from Platform, is responsible for generating revenue and operating its own P/L. The Platform Team receives a “tax” from the business units to fund itself (see Appendix A below). We have a similar view to startups as Dave McClure’s Hacker, Hustler, and Designer model. We prefer to call it Business, Product, and Engineering, but the point is the same. A startup should be managed by three people working as a partnership leading those three functions. These three people are called a Trifecta. Each business unit at Carta is managed by a Trifecta. 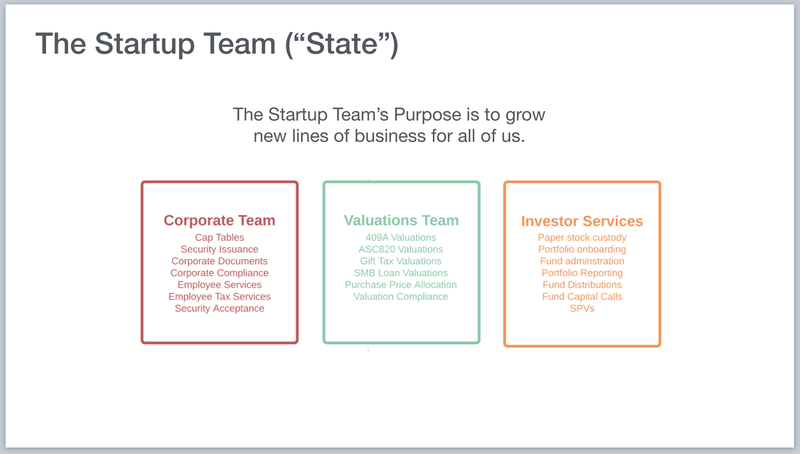 If we want to start a new business unit, we form a new Trifecta, give them some capital, and let them run. At the top is a Platform Trifecta that manages the BU Trifectas. The Platform Trifecta is myself (Business), Josh, (Product), and the head of engineering (who we are currently looking for). 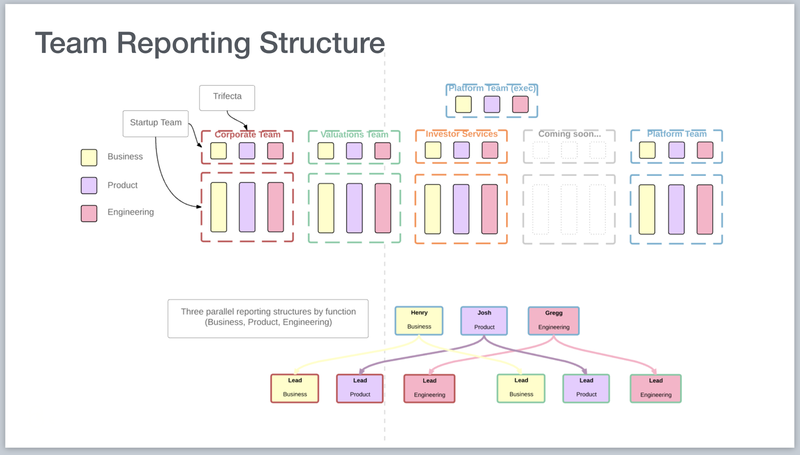 This creates three parallel reporting paths: the business trifecta leads report to me, the product trifecta leads report to Josh, and the engineering trifecta leads report to the head of engineering. There is no single person at the top. The atomic unit of executive decision making is a Trifecta. 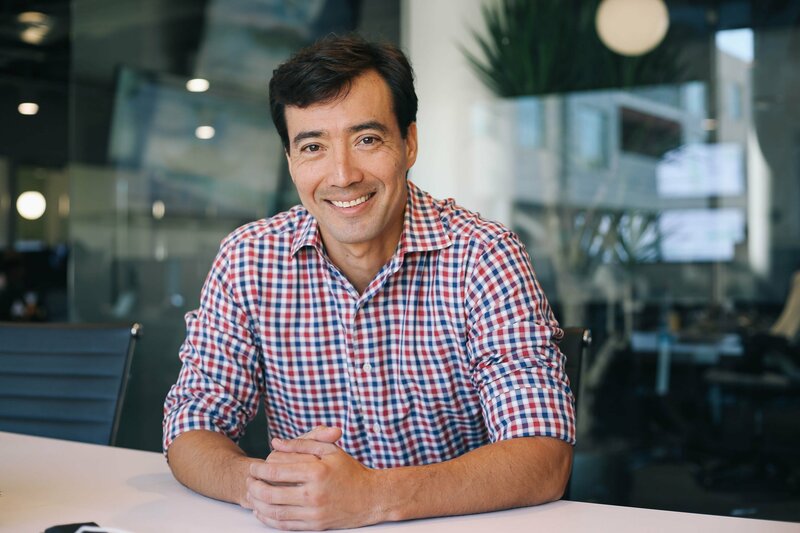 Each Trifecta is jointly responsible for the success of their business, much like three cofounders succeed or fail together. We allocate this target burn across the business units. Below are the targets we set for 2016. Note that this is on GAAP revenue. Each business unit has similar decision trade-offs. 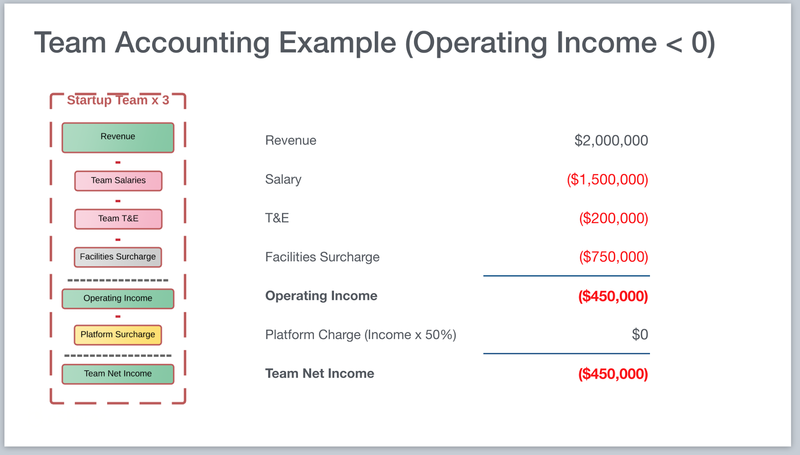 They are allocated a certain amount of equity capital (for example, $200K/month for the corporate team) and have to fund any expense or investment beyond that by earning revenue. We think of ourselves as a startup factory. We can take an idea and a Trifecta team and launch a new business unit. The overhead of starting a business (office space, raising capital, recruiting, culture, etc…) are abstracted away by the Platform. Trifectas can focus exclusively on building a product and business without distraction. And we have a strong balance sheet of ~$17M to fund these business units. The speed with which we can fire up new businesses is remarkable. Once a business unit hits product market fit, they get instant distribution to 4,000 companies and 250,000 shareholders/employees. These days we add about 300 companies and 10,000 shareholders/employees to our network each month. Every new business gets to sell into that growth curve at zero CAC. 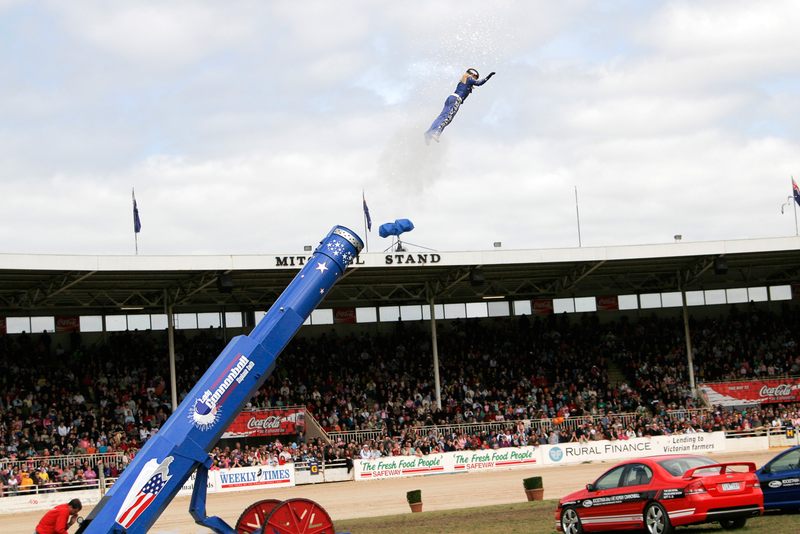 It is like launching a startup out of cannon. 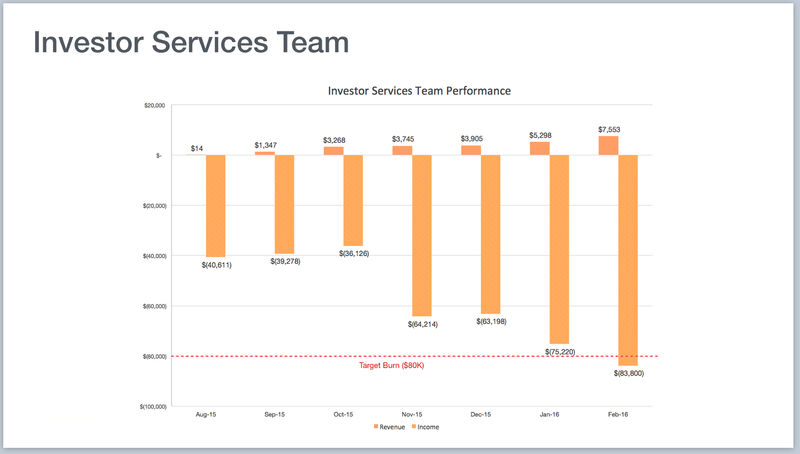 Since we pass the zero CAC savings to our customers, the more we grow the more defensible each business unit becomes. Our moats expand with each new business unit and each new customer. Frictionless distribution is incredibly powerful. At Carta we often talk about 0–1 people and 1–n people. Many startups are founded by 0–1 people. As the company begins to scale they are replaced by 1–n people. We want to be a company where both 0–1 and 1-n people can do their best work for many years. This model gives us that. 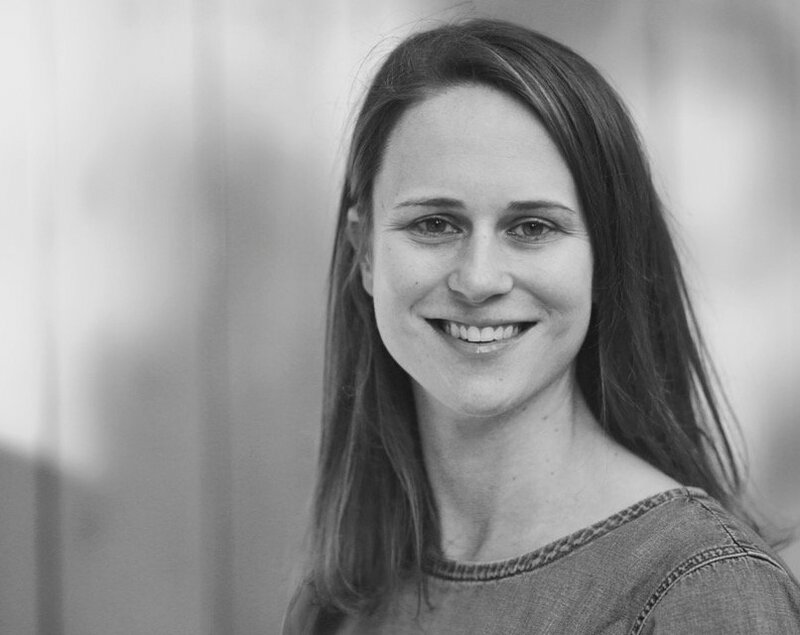 We launch a new business unit with a team of 0–1 people. When the team hits escape velocity, those who want to learn how to do 1-n can stay on the team. Those who want only to do 0–1 can join or start a new business unit. And we keep a deep bench of amazing 1-n people who can come in and scale our businesses. At any point in time we are recruiting founders to help start new businesses and executives to scale those businesses. Future founders and executives: Come to Carta to work for amazing founders and executives and learn how to be one. 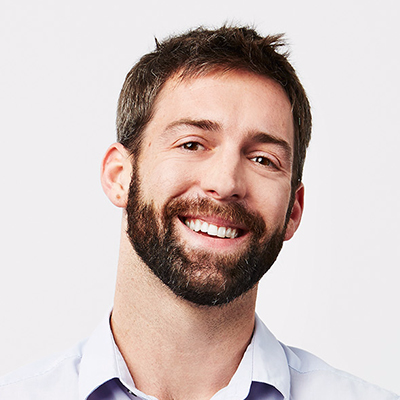 Founders: Help start a 0–1 Business Unit at Carta. You will have the opportunity to build a business at light-speed. And we will teach you everything we know. Executives: Help scale our 1-n Business Units. Our current business units are hitting escape velocity right now and we have more coming. The size of business you can build here is limited only by you. My pitch is cross-function: we need business founders and engineering executives and vice versa. If you can build stuff or grow stuff we have a need for you. And if you have an idea for a new business unit to build on the Carta network, I am all ears. 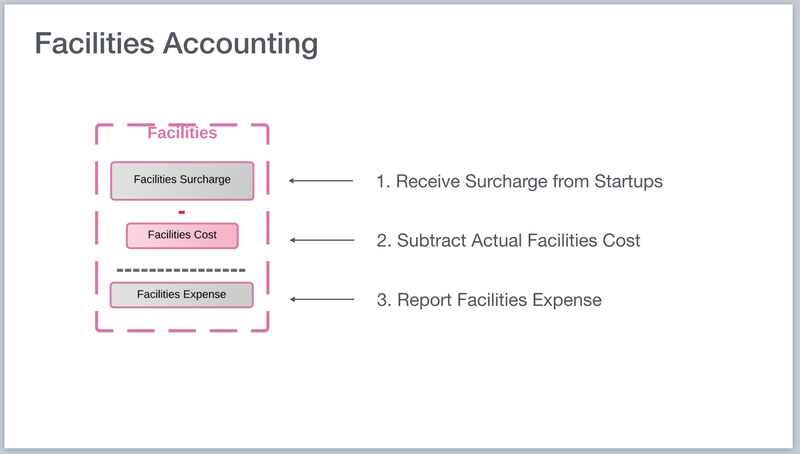 Within each business unit income statement is a Facilities surcharge and Platform surcharge. Think of these as taxes paid back to Platform Team. 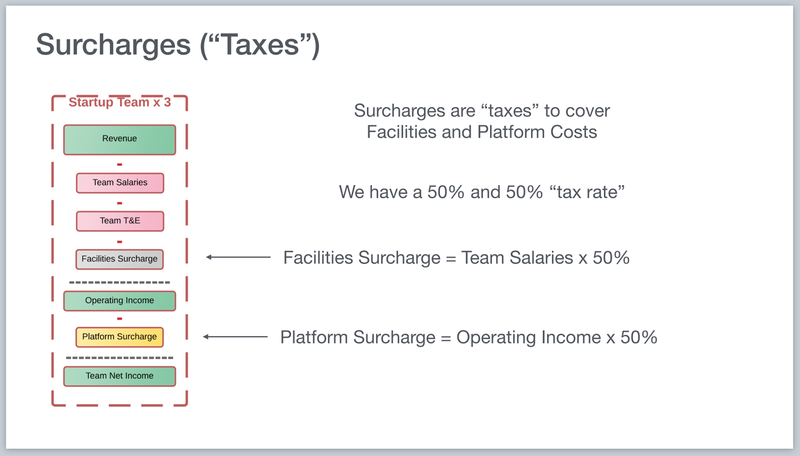 The Facilities surcharge is calculated as 50% of a business unit’s salary payroll. For every dollar that a business unit pays in salary, they pay $0.50 as a Facilities surcharge for office space, healthcare, lunch, etc. It is a consumption tax on our most expensive asset, people. 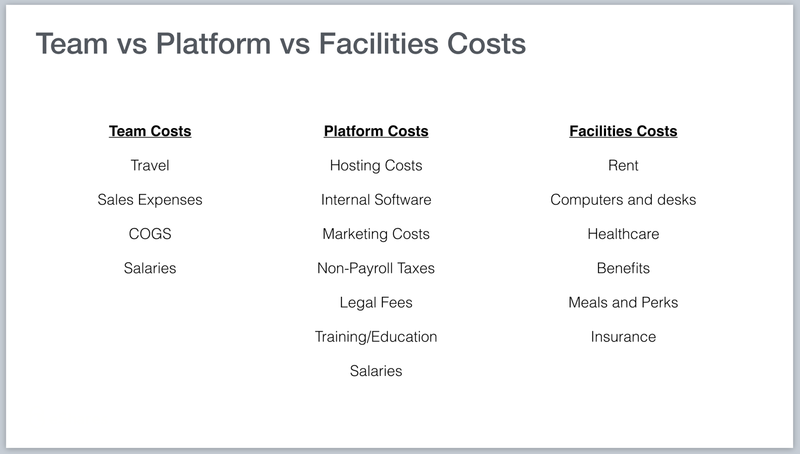 The Platform surcharge is an income tax on the profit of a business unit. This is the only way for the Platform team to generate revenue, and so their purpose is to get business units profitable as quickly as possible. 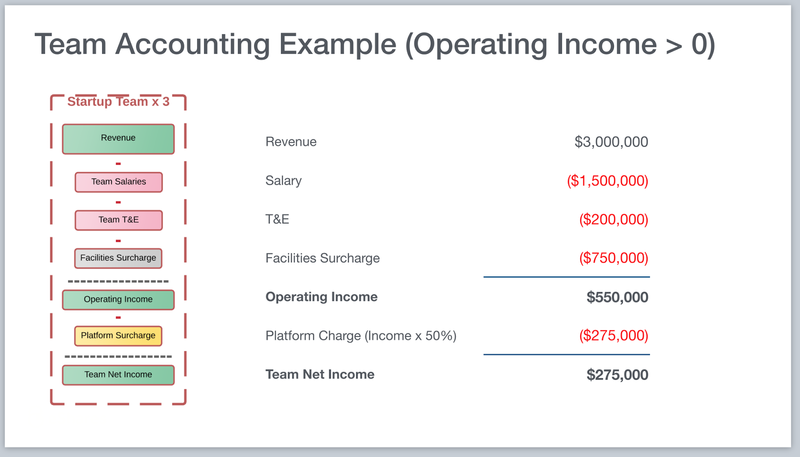 Below are example income statements for an unprofitable and a profitable business unit. 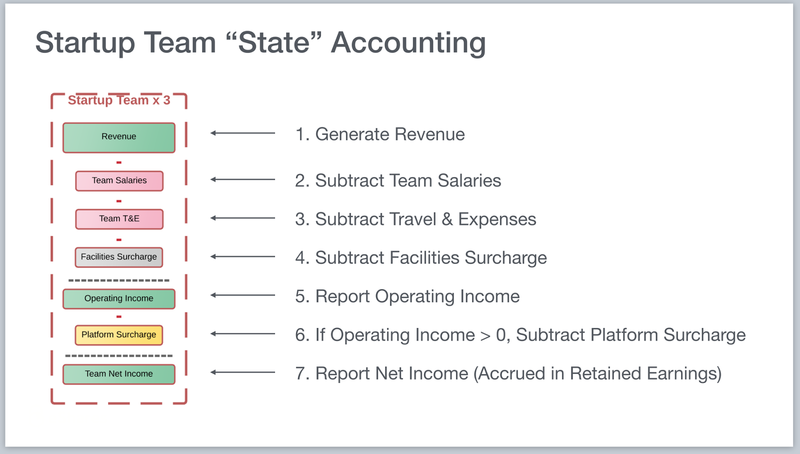 The Platform team has a similar income statement, but their “revenue” comes from the income tax of the other business units. They also pay a Facilities surcharge. 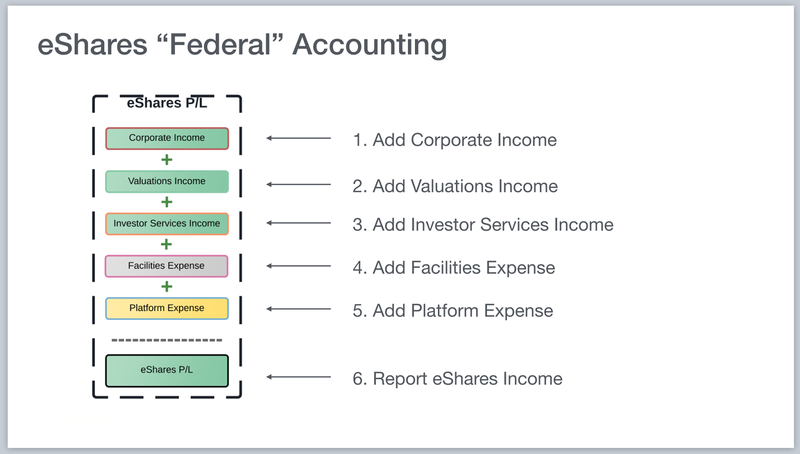 The Facilities income statement is the simplest. 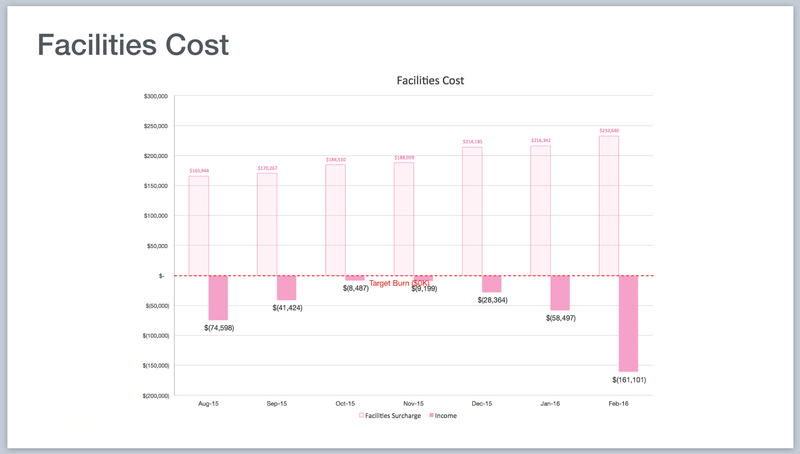 You take the Facilities surcharge (equal to 50% of payroll) and subtract actual facilities cost to get the net Facilities expense. 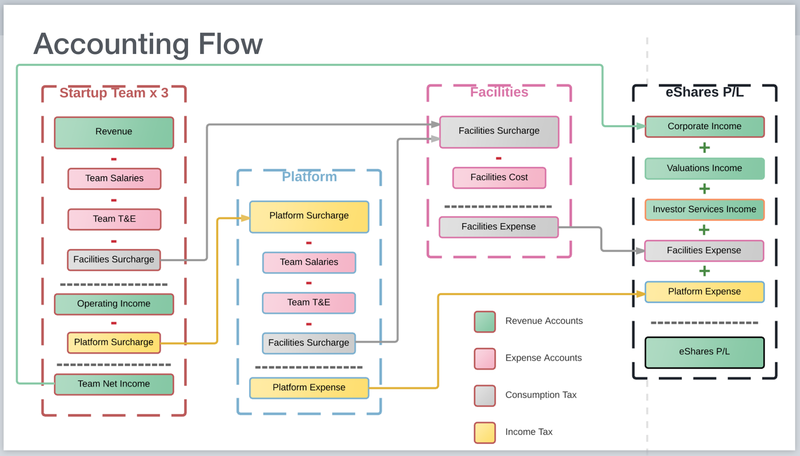 For the accounting geeks, below is the complete flow of monies and the corresponding accounting entries. 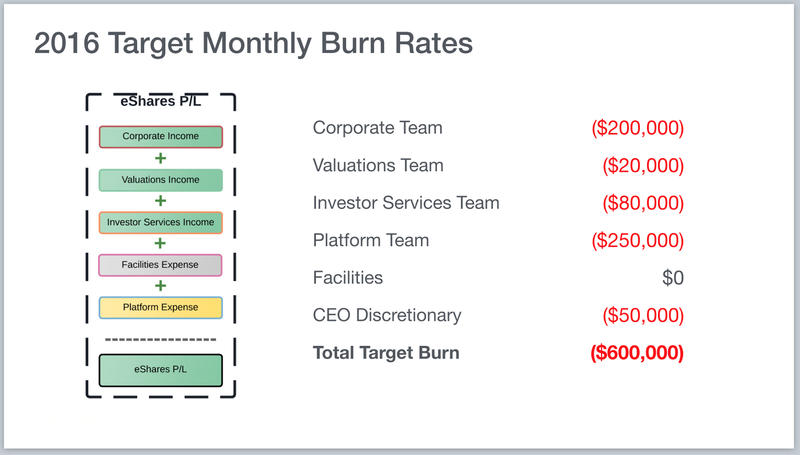 The burn rates below are target GAAP burn rates for each business unit. There is a CEO Discretionary which allows me to fund special projects. For example, if a business unit needs more money to scale ahead of revenue we can temporarily fund the growth through this account. You may notice the Facilities target burn rate of $0. Remember that Facilities collects a consumption tax (50% of payroll) from each of the business units to pay for health benefits, office space, meals, etc. 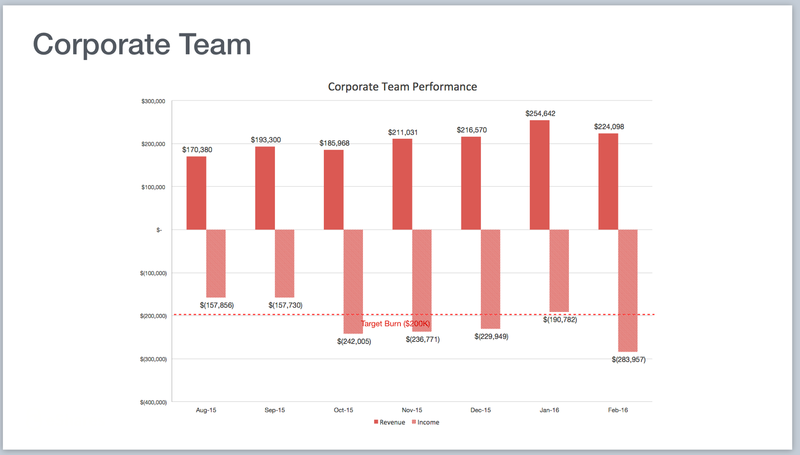 Targeting a $0 burn rate is the equivalent of telling our People team to provide the best employee experience we can for 50% of payroll. This is their budget. They use this constraint to make trade-offs between benefits like vision plans, gym memberships, and catered lunches. We think of the relationship of Business Units to the Platform similarly to the relationship of State Government vs Federal Government. I realize this can be a loaded phrase. But if you can see past the political connotations it is a useful analogy to understand how we separate responsibilities. If states are the laboratories of democracy, business units are the laboratories of growth. 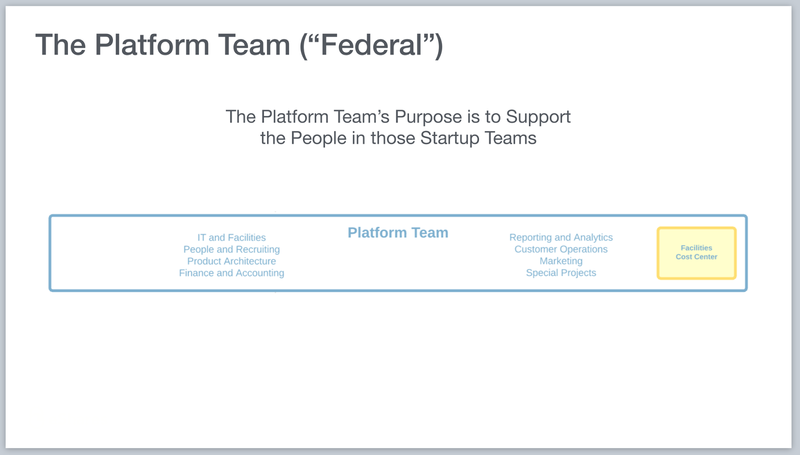 And it is the role of Platform Team, much like the Federal government, to align the business units and support them when they need us. 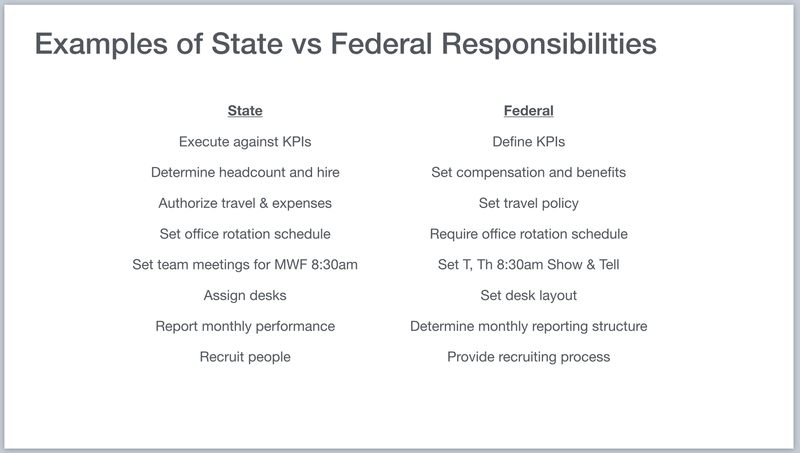 Below are examples of how we separate responsibility, and most importantly decision making, between the states and the federal trifecta. To pick one example, each business unit determines its headcount (constrained by burn rate targets) and who they should hire. Compensation, however, is set at the federal level. This is because employees should not have varied compensation based on the success and budget of their business unit. With this model we can report the P/L for each business unit and Carta as a whole. Each month the business Trifecta leads know whether they can hire or scale back based on their financials. The P/L charts below are old, but they give you a sense for how we track this.